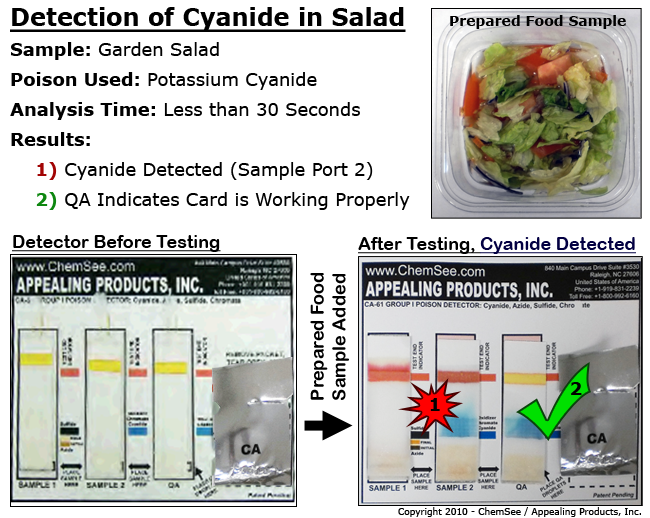 Recent terrorist threats have been made to poison restaurant and hotel food, especially salads, with cyanide. ChemSee’s Kits readily detect cyanide in salads and other foods and are the only available detectors for poisons in food. GAS-01 Arsenic Detector: Simple, color-based detector for arsenic in food and drink. CN-30 Cyanide Detector: Low cost, easy-to-use test for cyanide in food and drink. GHM-01 Detector for Heavy Metals: Low cost detection of heavy metals in water and urine. FRM-03 Detector for Formaldehyde: Simple, easy-to-use detectors for formaldehyde. 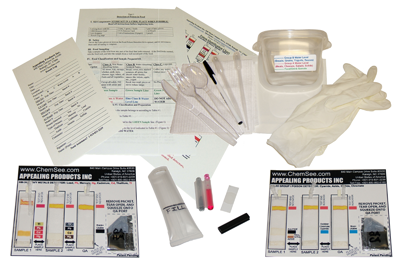 Several Detection Kits are available for the simple and rapid detection of poisons in food and drink. These Kits detect a broad range of the most commonly-used poisons and toxins via a simple color change. ChemSee is currently developing a line of detectors for pharmaceutical contaminants. A detector for residual azides in pharmaceutical solutions is available. In-lab sample testing is offered through ChemSee’s partner website: ChemSee-Foods. ChemSee’s Food Poison Detection Kits are the only detection Kits for poisons in food that have been positively validated by the U.S. Department of Defense. For additional information on the Kit’s validation, visit our validation information page. For pricing and additional information on these Kits, please Request a Quote and our representatives will contact you with additional information.